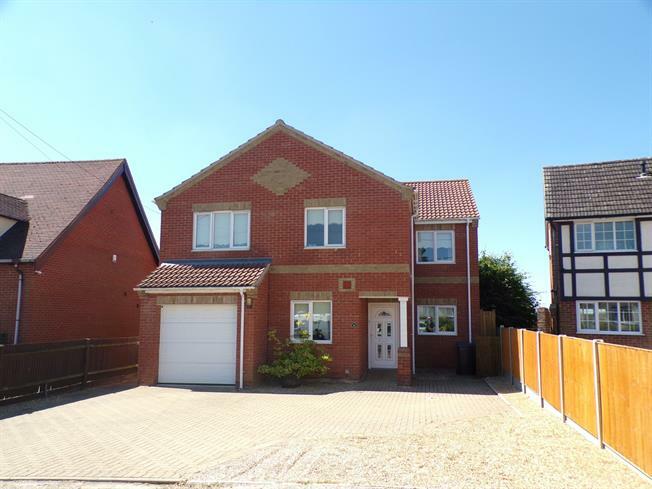 4 Bedroom Detached House For Sale in Braintree for Asking Price £450,000. This executive family home is spread across almost 3000 sq ft, and has been finished to the highest of standards. With four large double bedrooms, three bathrooms and generous reception space, this property would be ideal for a large or growing family. Each room in the property is a fantastic size, and the feeling of space is apparent throughout the home. The substantial rear garden has been landscaped for an ease of maintenance rarely seen in a garden of this size, comprising areas of decking and a large area of artificial grass, it is perfectly suited for entertaining, children or pets. The property backs on to an area of parkland and woodland with far reaching views. To the front there is a tandem integral garage and parking on the driveway for several cars. . The great size reception hall gives the feeling of space from the moment you enter the property, with doors leading to the ground floor rooms, elegant turning staircase and under stairs storage. At the very front of the property there is a generous sized study, which could also be used as a children's play room if required. Complete with plenty of plug sockets and telephone connections. Large front window allows you to work in full natural daylight. At the rear of the property the main sitting room offers fabulous views over the garden, a would burning stove with feature red brick chimney and three sets of French doors leading to; the garden, dining room and hallway. Open plant to the kitchen, the formal dining room is the perfect place for parties and entertaining. There is a windows overlooking the garden and French doors to the sitting room. The modern, gloss finish kitchen is complemented perfectly by the granite work surfaces including breakfast bar. The appliances are integral, with additional space in the utility room. Being dual aspect the room is flooded with light and it is the ideal design to cook whilst entertaining or keeping an eye on the children whilst they do their homework at the table! The separate utility is as big as many kitchens, there are range of eye and base units, stainless steel sink unit and plumbing for the washing machine and tumble dryer. There is also a personal door through to the Garage and a window to the side. The ever important ground floor cloakroom, offers a low level WC and a wall hung basin. The modern white suite is complemented by contemporary tiling. The spacious galleried landing offers access to all of the first floor rooms, there is also a window to the side and a double sized airing cupboard. The master suite is at the rear of the property and combines a generous king sized bedroom and private En-Suite shower room. There are two windows to the rear with far reaching views and more than enough room for all bedroom furniture. A white three piece bathroom suite comprising; low level WC, double built in shower enclosure and pedestal wash hand basin. Similar in size to the master bedroom, this room is also located at the rear of the property with the far reaching views. At the very front of the property this double bedroom also comes with a walk n wardrobe. A further double bedroom with a window facing the front. A versatile storage room currently used as a computer room or office, there is no window to this room and it could equally be used as a walk in wardrobe or pantry. The feeling of space continues as you enter the family bathroom, the magnificent four piece bathroom suite comprises; panel enclosed bath, double shower enclosure with power shower and smoked glass, low level WC and pedestal wash hand basin. The many mirrors bounce the light around perfectly and the room is finished with a contemporary tile. The substantial rear garden has been landscaped for an ease of maintenance rarely seen in a garden of this size, comprising areas of decking and a large area of artificial grass, it is perfectly suited for entertaining, children or pets. The property backs on to an area of parkland and woodland with far reaching views. The double length garage is integral to the property and also has power and light. To the front of the property there is a large driveway with enough parking for several vehicles.